Please see the updated of Malwarebytes for Android review in a Security section, or click here. Malwarebytes Antivirus and Antimalware for Android offers customers all the necessary features to keep their phones safe and clean. Malwarebytes for Android is antivirus mobile security, virus detector, and device cleaner. The Malwarebytes app gives its customers security and antivirus protection against the latest malware, ransomware, adware and unauthorized surveillance. Malwarebytes Security automatically stops suspicious and dangerous software, including malware and ransomware. As a result, you do not have to worry about your smartphone or tablet being infected and compromised. Malwarebytes Antivirus and Antimalware offers advanced detection of adware and PUP also known as potentially unwanted programs that keep your Android device running smooth and without lag. In addition, a privacy audit notifies you about apps that are monitoring your activities. All of this protection is offered in a lean package. What does Malwarebytes Antivirus and Antimalware for Android offer? Malwarebytes for Android scans all files and applications for potentially unwanted programs or PUPs, all kinds of malware and malicious software, screen lockers and adware. The scans are quick and effective. 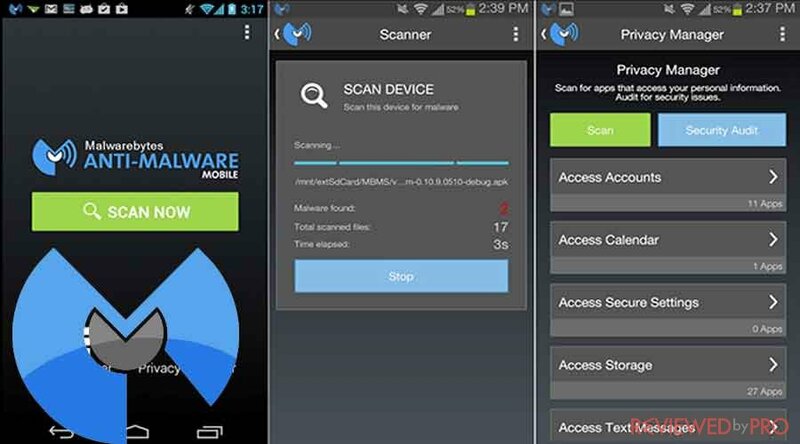 In addition, Malwarebytes offers advanced award-winning detection of junk apps to free up your Android device. Malwarebytes’ real-time protection effectively safeguards your mobile device from any infection. 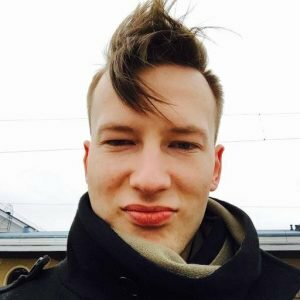 As you know, Android mobile threats are on the rise now, but advanced technologies are capable of blocking suspicious software and dangerous newcomers including ransomware, unauthorized surveillance, and other threats. With Malwarebytes antivirus software you won’t have to worry about malicious apps with suspicious codes or if they are bundled with PUPs. Award-winning anti-malware, anti-ransomware and anti-adware technologies detect malicious software and dangerous files before they infect your device, steal your personal information, eavesdrop, or degrade your mobile experience, so your Android phone or tablet will run smoothly. Malwarebytes’ advanced technologies identify the access privileges of every single application installed on your Android phone or tablet. 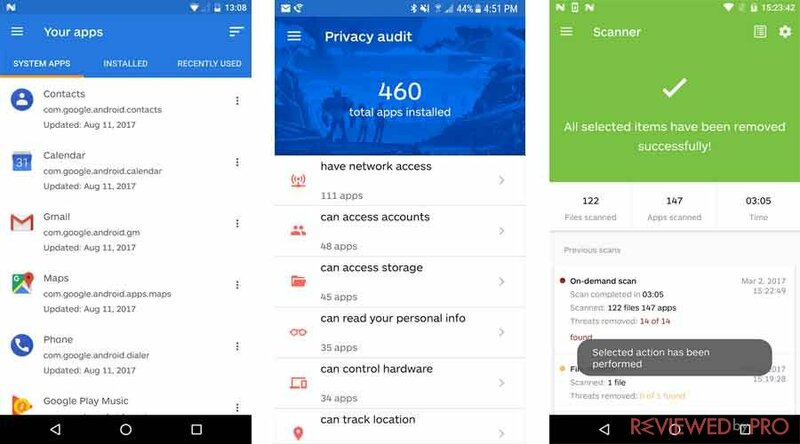 As a result, Malwarebytes for Android enables you to know exactly what information you are sharing through your apps. You can keep tabs on which applications are able to track your location, monitor incoming, and outgoing calls and even cost you addition hidden fees. Malwarebytes gives you an easy-to-understand and navigates information about the status of your smartphone’s or tablet’s security. The user interface is very clean and simple so users will not face any problems. Malwarebytes detects phishing and other malicious URLs in Google Chrome browser and notifies you when any of them are detected. Malwarebytes ensures you a safe experience while browsing and surfing the Internet. 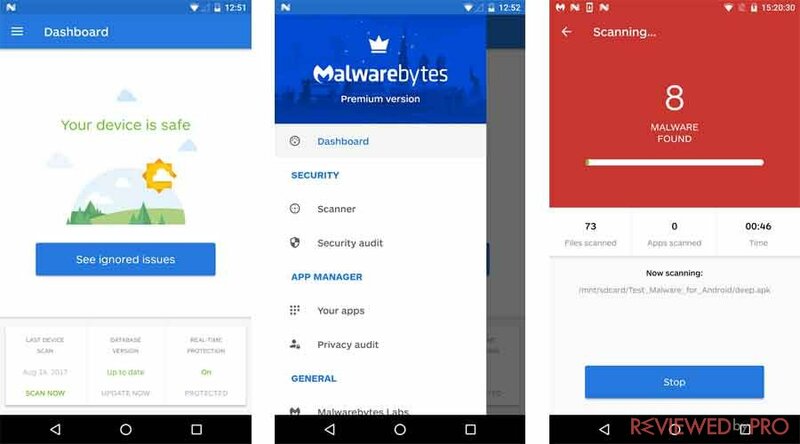 Malwarebytes Antivirus and Antimalware for Android preserves your smartphone’s or tablet’s performance by adding only the necessary protection and security features, for instance, a malware detector and cleaner. In addition, you can update a database over a Wi-Fi network in order to reduce your device’s mobile data usage. Malwarebytes for Android shows your device’s security status from the home screen. Malwarebytes for Android also enables you to secure your Android device remotely just by sending text messages commands. Malwarebytes Antivirus and Antimalware for Android was installed from 10,000,000 to 50,000,000 times on the Google Play store and was praised by users. This app is great! I was having a problem with ads showing on my home screen on my phone and the worthless antivirus I was using didn’t detect anything. I installed this beautiful app and it detected that I had adware and deleted it. Now I no longer see ads on my phone! Thanks again. Malwarebytes Antivirus and Antimalware for Android uses the Device’s Administrator permission. Malwarebytes Antivirus and Antimalware for Android is compatible with Android devices that run 4.1 or later. It also supports English, Dutch, French, German, Italian, Polish, Russian, Spanish, Turkish, Portuguese and Indonesian languages. You can download Malwarebytes Security for Android and enjoy a free 30-day trial of Premium version. Malwarebytes is an American cybersecurity company which focuses on security software and services for home users and businesses. Malwarebytes was founded in 2008 and since then Malwarebytes provides advanced, award-winning protection against malware, ransomware, adware and other threats. Malwarebytes uses several proprietary technologies and methods to provide security software and services that consumers can rely on. ^ Malwarebytes for Android. Malwarebytes . ^ Malwarebytes Security: Antivirus & Anti-Malware. Google Play. This entry was posted on 2018-01-23 at 08:43 and is filed under News.